Fakespeare opens the door to Shakespeare's worlds using his settings and characters in unique ways. Something Stinks in Hamlet, for instance, transports Halley, Kyle, and Kyle's young brother Gabe to Elsinore where the adventure begins. The gang must help Hamlet before they can get back home. If you're looking for a retelling of Hamlet at an upper elementary reading level, this is not it. 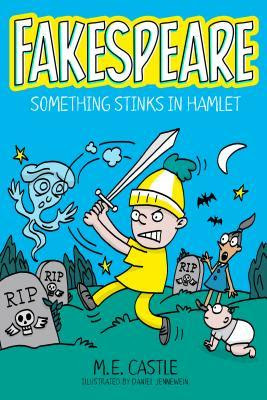 However, if you're looking for a funny book about being sucked into Hamlet's world with humor for an eight or nine year old, then Fakespeare is just what you need. If you’re interested in reading Fakespeare: Something Stinks in Hamlet, you can purchase a copy here on Amazon.